Use these wipes to restore your bowling ball's original feel in between frames. Convenient, does a great job! When done bowling, pull a wipe, rub down ball, turn the wipe over and rub one more time over entire surface. Ball is perfect. Grabs the alley exactly like it day the day I bought the ball. I clean the ball after every league night. Really removes the oil and grime and brings the dull sheen back. Best I have found for doing that. I first got these while I was shooting in mini sport shot tournaments over the summer. There would be 3 qualif games then match play. I wanted to use something between match play and qualif and since they are approved for any time it was great. First time I used them I could tell right away they improved the tack of the ball and took a lot of oil off the cover stock. Great Product again by Storm and would def recommend them for use anytime you need to get that excess oil off the ball. Use before each bowling session. I am able to hold onto the ball better as it does not slip out of my hand. Therefore, I have better control and my average is steadily increasing. This is my repeat purchase and I'm buying 2 since they're on sale. They really clean well and smell great. I always hated carrying a spray bottle of ball cleaner and cleaning towel. These are very compact and do an excellent job of cleaning your ball. This product can get rid of the oily grease from the lanes. It haves a nice clean scent. Are these cleaning wipes good to use on the storm match pearl bowling ball? Thanks ! Hello. You can use these wipes on any Storm bowling ball. How often should I use these? You can use them when you notice a difference in performance of your ball. Are these safe to use for any brand of reactive ball? 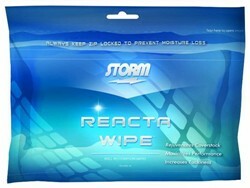 Due to the time it takes to produce the Storm Reacta Wipes ball it will ship in immediately. We cannot ship this ball outside the United States.